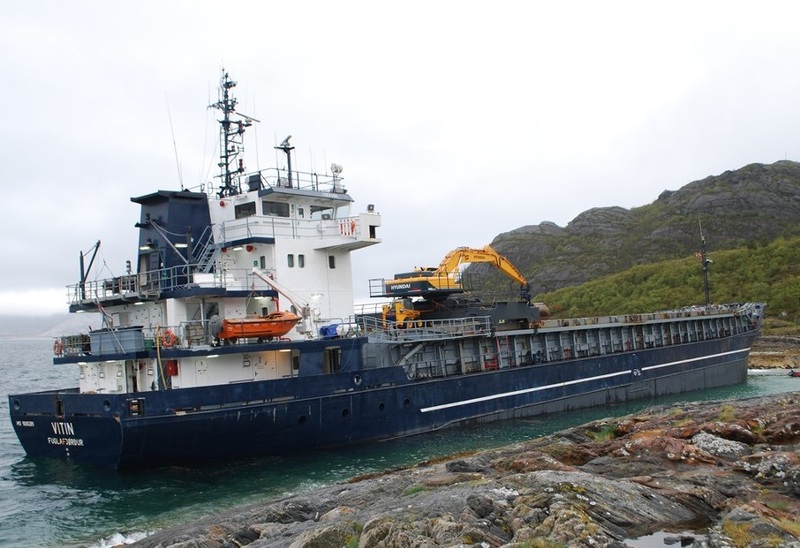 The general cargo ship Vitin ran aground off Tonnes in Luroy, Norway. The vessel was en route from Husoy to Myre with cargo of fishmeal, but suffered technical failure and went ashore south of Bodo. The accident was reported to local authorities but there was no immediate danger for the ship and the crew. There was a small breach in one of the ballast tanks, which took waster ingress but without endangering the seaworthiness of the general cargo ship. There were no reported injuries and no water pollution. At the scene was sent rescue boat Ruth Opsahl and tug Boa Brage, which assisted with refloating of the cargo vessel Vitin in high tide. The ship was escorted to Sandnessjoen, where will be inspected and repaired before return in service. “There is water ingress into a small ballast tank, but not of such nature that may cause some danger”, said the skipped of the salvage tug, which refloated the vessel, Ragnar Gustavsen. “We slept at the tow boat and waited for the high tide. Quarter past three, it was great. The area they went aground consists mostly of sandy bottom and is of course ideal when the worst happens”, added he. The salvors added that they are now escorting the ship south to Sandnessjoen. The plan is to anchored near the island, so that maritime authorities can do a more thorough inspection before allow returning in service. The investigation for the root cause of the accident is under way. The general cargo ship Vitin (IMO: 9006289) has overall length of 88.00 m, moulded beam of 13.00 m and maximum draft of 5.40 m. The deadweight of the ship is 3,710 DWT and the gross tonnage is 2,449 GRT. The freighter was built in 1992 by PS Werften Wolgast in their shipyard in Germany.